Died: 18th July 1915; age: 57; at Ruhleben Camp, Spandau, Berlin. Residence: 7, Vernon Street, Ipswich. Ribbons which lay on Charles’s coffin. 1861 19, Victoria Street, Ipswich. 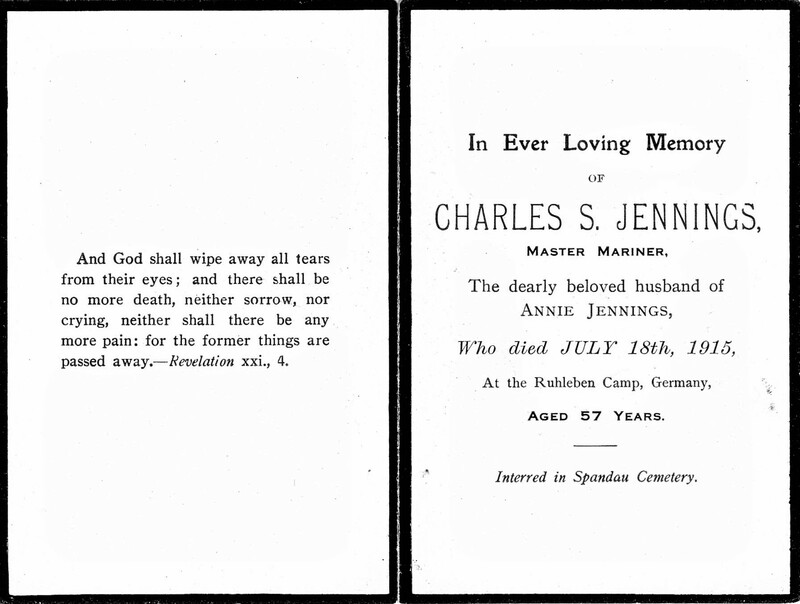 Charles Frederick Jennings, 31, a Mariner, born St. Clement’s, Ipswich. Elizabeth Jennings (nee Farthing),28, born Ipswich. Mary Ann Emily Jennings, 5, born Ipswich. William Nelson Jennings, 1, born Ipswich. 1901 7, Vernon Street, Ipswich. 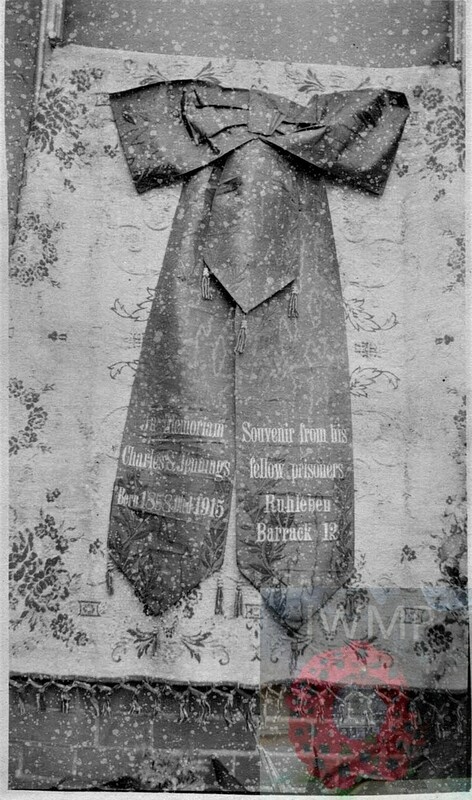 Charles was 43 years old, a Foreman – Foundry. He was married and Head of the Household. 1911 7, Vernon Street, Ipswich. Charles was away from the family home. Annie, 25, an Assistant Teacher – Ipswich Education Committee. Charles, 22, an Engineer Pattern Maker. Abbie, 18, a Shop Assistant – Drapery. Charles’s mother, Elizabeth Jennings died 1885, Ipswich. 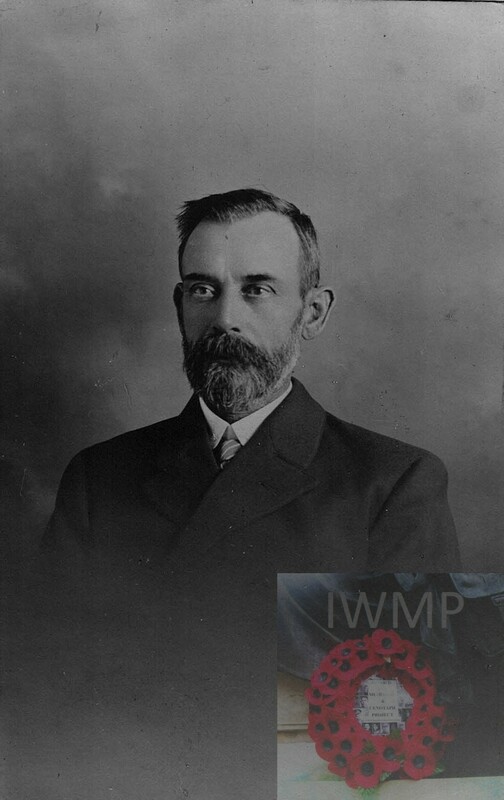 In 1883, Ipswich, Charles married Anna Colthorpe, born 1861, Ipswich, of Tyler Street, Ipswich. A Dressmaker. Annie Gertrude Jennings, born September 1885, Ipswich. Charles Nelson Jennings, born December 1888, Ipswich. Abbie Elizabeth Jennings, born 1892, Ipswich. 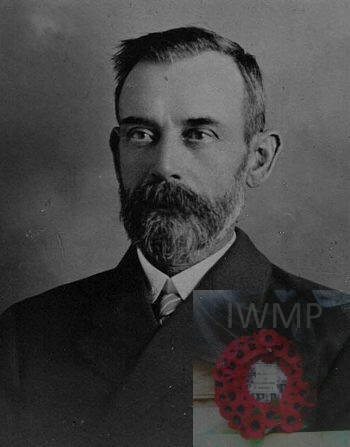 Frederick James Jennings, born 1901, Ipswich. Tuesday 4th August 1914 Britain declares War on Germany. British ships were seized in German waters and the crews detained. On the River Weser, NW Germany, at Bremerhaven the SS ROSSALL, a cargo steamship registered in London owned by Austin Friars Steamship Co. On the 4th of August the ship was boarded and the crew taken into custardy as prisoners of war. 1914-1918 war there were no rules on how prisoners were kept. Many faced starvation and inhuman conditions. Prisoners were also used as slave labour. Charles was held at “Barrack 12” Ruhleben internment camp on the outskirts of Berlin. The civilian detention camp held many British fishermen, Merchant navy crews and European civilians unable to escape the country in time. Quarters were cramped as the camp was a former races course and Manor house using the large number of stable blocks as housing. As a male civilian camp it was able to organise its self with its own postal system entertainment and sports events. 4,000 and 5,500 prisoners were held in the camp. Medical care was limited with outbreaks of sickness from Typhoid, Cholera and later Flue.